Adraki Jhinga recipe by Nazia Nazar at DesiRecipes.com. De vein prawns and remove the shells keeping the tails intact. Apply salt , lemon juice, ginger , green chilli paste to the prawns and keep aside for fifteen minutes. Heat oil in a shallow frying pan and cook marinated prawns for two minutes. 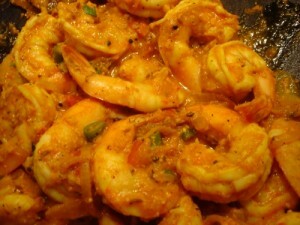 Do not over cook prawns as they tend to become tough and rubber like. Drain onto an absorbent paper. For peanut dip, peel dry roast cumin seeds , mustard seeds and whole red chillies. Grind these and roasted peanuts to a fine paste by adding half cup of water. Heat oil in a pan, add chopped onion and ginger . Saut till onions become soft and change colour slightly. Add peanut paste and cook on a medium heat for a minute. Add tamarind paste dissolved in a little water to this and cook for a few minutes. Stir in coconut milk and simmer for five minutes. Serve this dip with sauted prawns. Thank you so much for the wonderful recipes.Sea food are my favorite dish.Especially prone.I likes variety of prone dish.I am definitely going to make this recipe.